Indonesia has refused to grant political asylum to 193 migrants from Myanmar and Bangladesh who are being held at a navy base after they were found stranded off the country's western coast. Most of the group identified themselves as the Rohingya - a Muslim ethnic group from Myanmar. The migrants were found floating in an 11-metre wooden boat without food or water, officials said. Hassan Wirajuda, the foreign minister, said on Friday that the people are economic migrants and not political asylum seekers. But according to Human Rights Watch, more than 250,000 Rohingyas fled Myanmar to Bangladesh in 1992 amid a campaign of persecution and what many have labelled "ethnic cleansing" on the part of the government in Naypyidaw. Shortly after their arrival on Sabang, Imam Husen, one of the migrants, told the Reuters news agency from his hospital bed that he and about 580 other people had set off from Mundu in Myanmar in four boats on December 9 to flee the country. He said some members of the group had been beaten after landing in Thailand. They were then towed out to sea and set adrift, he said. According to Wirajuda, citing accounts by the navy, many died on the trip to Indonesia during which they had to stand because the boat was so full. Imam Husen's testimony corroborates reports from a Rohingya human-rights group and Indian police reports from other Rohingyas found adrift near the Andaman Islands that Thai security forces towed 992 people out to sea and abandoned them in engine-less boats. 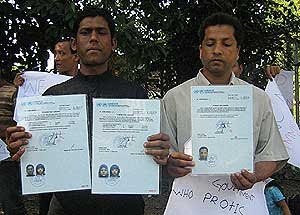 The Arakan Project, a Rohingya non-governmental organisation, estimates that 550 of the 992 are missing, feared drowned. Colonel Manas Kongpan of the Internal Security Operations Command (Isoc) denied on Tuesday any abuse, saying that all the migrants who arrived in Thailand were sent out to sea with food and water. About 28,000 Rohingyas recognised as refugees are living in UNHCR camps in Bangladesh. I have been following these poor people for many years now and there seems to be no light at the end of their trouble. Among those most fervently hoping for an end to the military regime are a Muslim minority known as the Rohingyas, whose home territory is on the western coast of Burma. Their language is similar to that of the people of the neighboring Chittagong area of Bangladesh—which the military regime has used to support its claim that they were Bengali immigrants with no right to Burmese citizenship. In fact, when the British occupied the area in 1825, they found that half the population of the Arakan area were Muslims. In 1992, the Burmese army combed the Rohingya areas of the Arakan region, driving the alleged “foreigners” from their homes. Some fled to other parts of Burma, but 250,000 crossed the border into Bangladesh. They were officially regarded as “undocumented people” rather than refugees. Poor, densely populated Bangladesh took a helpful attitude at first, but soon wearied of the Rohingyas’ presence. It mounted pressure on Burma to allow their return and on the refugees to leave. 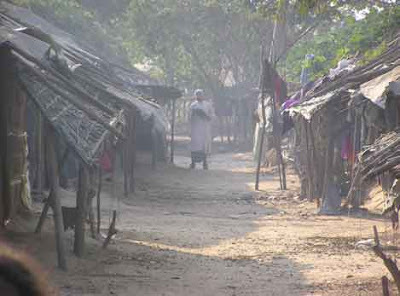 The majority were readmitted to Burma, but a smaller wave arrived in Bangladesh in 1996-97. Those who remained in Burma or returned there are still denied citizenship, refused the right to own property and discriminated against. During military campaigns, they have been forced to labor on projects for the army. Rohingyas are at the bottom of the economic pile in a country that, in 2006, had a per capita GDP of $1,800, compared to $2,300 in Bangladesh. No wonder they supported the movement of protest against the military authorities. 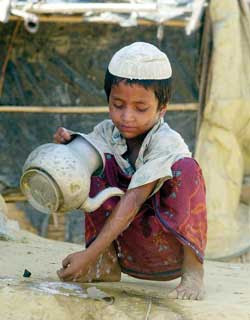 May Allah help them in their struggle.